Several bands have tried to merge electronic music with Metal but Oomph! are one of the true pioneers of this concept. Often shelved in the 'Gothic' pidgeon-hole, this music has always been particularly popular in Germany. Sure enough, the lyrics of Oomph! 's songs are prevalently in German, their mother tongue. 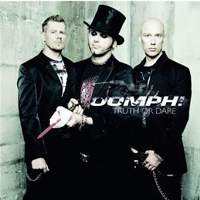 In "Truth Or Dare" the band attempts to make their music more widely accessible by reoffering a selection of their repertoire...with English lyrics. The quality of the songs vary and sometimes the ‘translated’ version don't always work, such as in 'Sandman' and 'Burning Desire', the latter featuring L'Ame Immortelle, another Electro-Goth pioneer. On the whole, however, these versions are quite good. 'Song Of Death', for example, is haunting but captivating. 'Crucified' is also one of the better songs and is highly reminiscent of Rammstein, on whom Oomph! were an important source of inspiration. What probably sets Oomph! apart from other Electro-Metal bands is a strong focus on songwriting skills rather than atmosphere and this is perfectly epitomised in this collection.